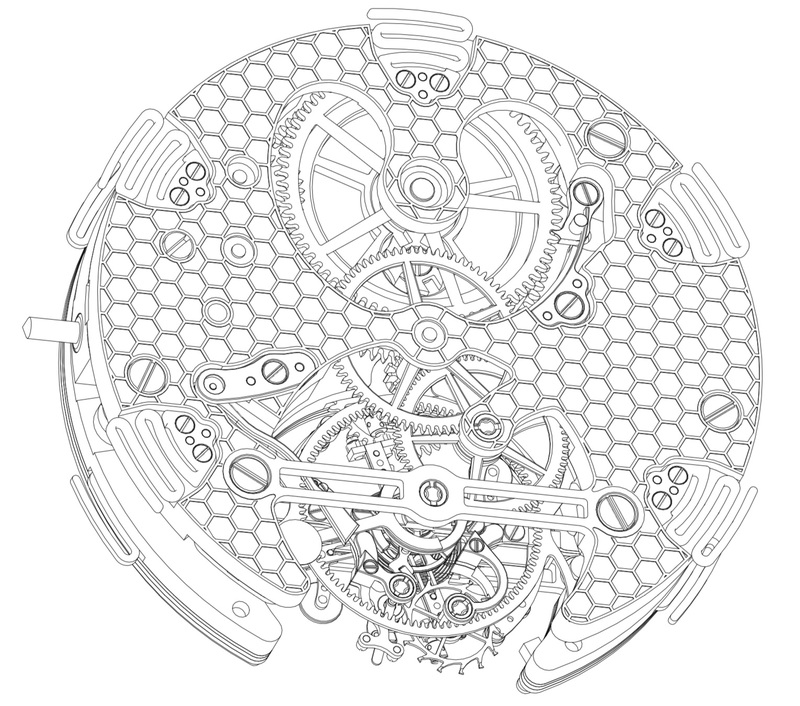 Montres KF unveils a sports version of its Spirograph Tourbillon with elastic shock absorbers, regulated by an innovative thermo-compensated balance wheel. If you are a regular reader of MONOCHROME, then you are no doubt already familiar with Karsten Frässdorf. 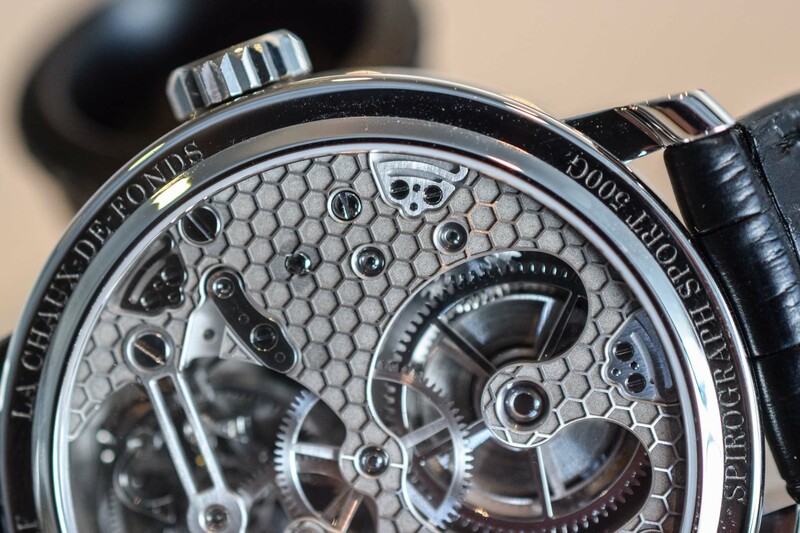 After working behind the scene for several brands, the German Master watchmaker decided to create his own brand. His first creation with Montres Karsten Frässdorf, the Spirograph Tourbillon, is an innovative Tourbillon fit for daily wear and tested to resist shocks of up to 5000 G and magnetic fields up to 1000 Gauss. As an evolution of this model, the brand introduces the Spirograph Tourbillon Sport, which includes some highly technical innovations. The 45mm case of the Spirograph Tourbillon houses a hand-wound movement entirely thought-out and built around its innovative regulating organ – which aims for optimal chronometric performance. 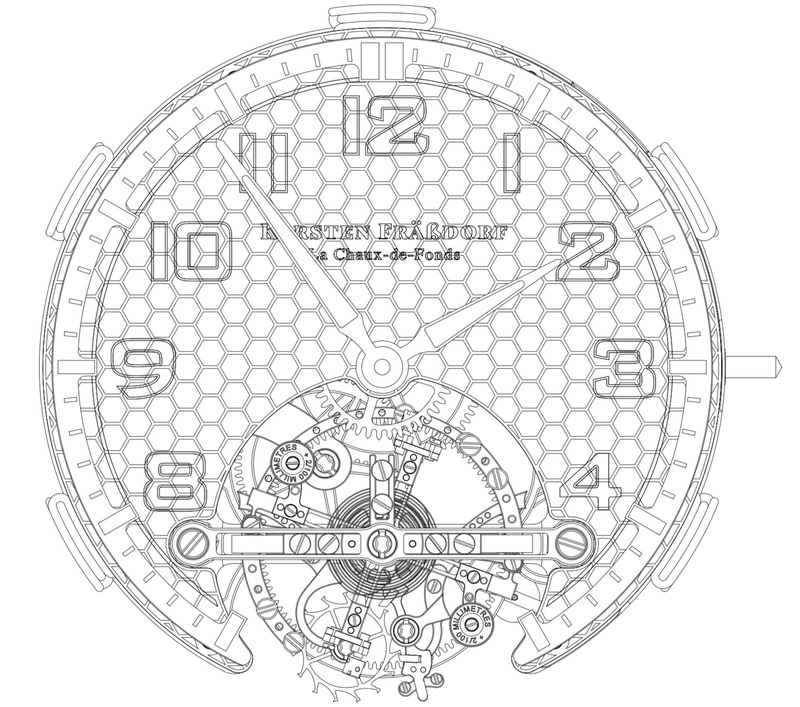 Featuring a pillar architecture, the movement is regulated by an eye-catching oversized tourbillon, operating at 18,000 vibrations per hour and featuring several innovations. The barrel of the Spirograph Tourbillon is able to store up to 70 hours of power reserve but in reality, only 44 hours are used – as a Geneva stop-work limits the operating range to the point where the force supplied to the regulator is nearly linear. The shock protection for the winding stem is integrated into a modular winding block that can be replaced integrally (for more details read our in-depth review here). 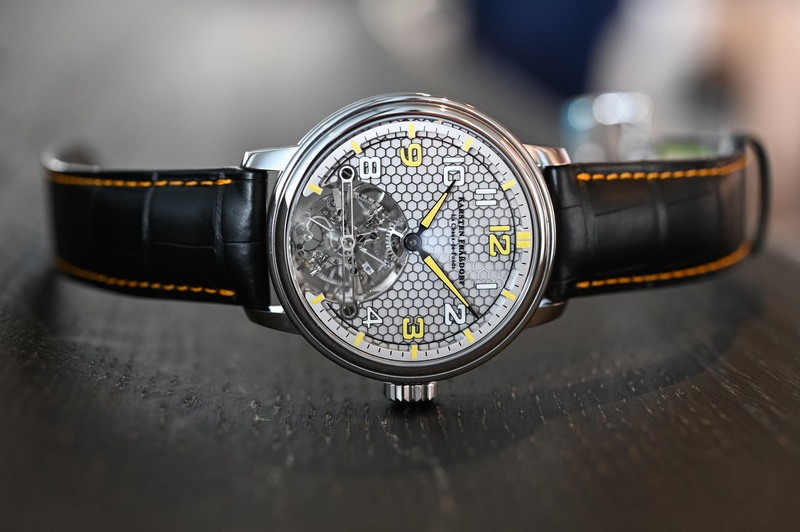 At Baselworld 2019, Karsten Frässdorf unveils a new version that goes a few steps further, packed with a bunch of additional innovative features that deserve a close look. The first thing to catch the eye with the Spirograph Tourbillon Sport is naturally its dynamic look. The watch stands out with its “sandwich” dial and vivid yellow accents. Together with the oversized one-minute tourbillon, this creates a striking sense of depth. 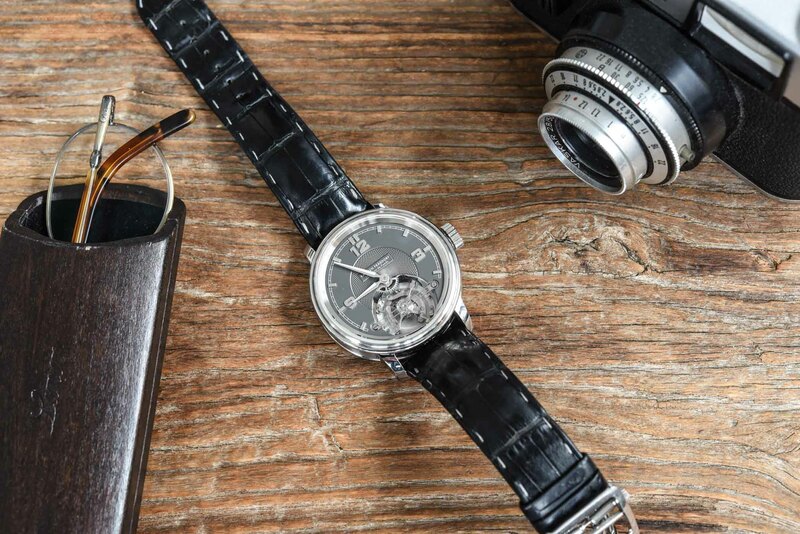 The sophisticated dial can be customized. 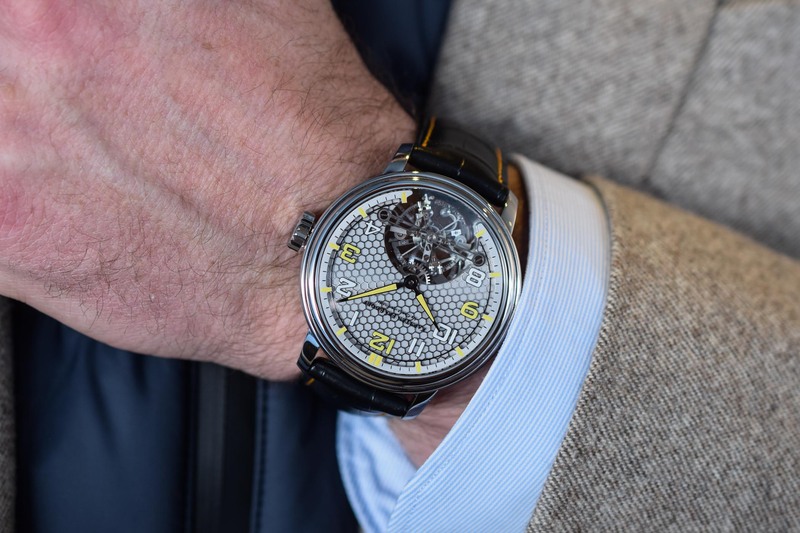 It is made of four different layers: a base plate, a honeycomb motif (a tribute to the coat of arms of La Chaux-de-Fonds, where the watch is manufactured), a sapphire disc with transferred numerals and the inner flange with the indexes. 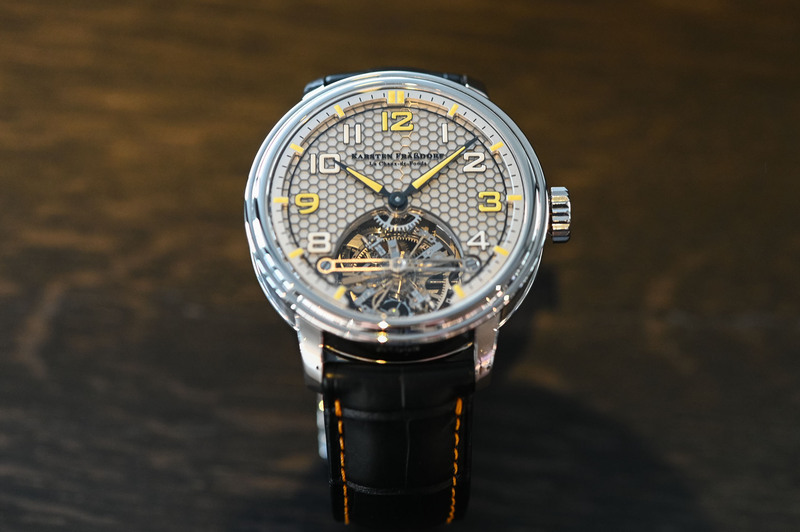 Turning the watch over, the Spirograph is now fitted with an exhibition caseback that offers an interesting view on the movement, also decorated with a honeycomb pattern. An interesting detail is how the movement is fixed to the case. 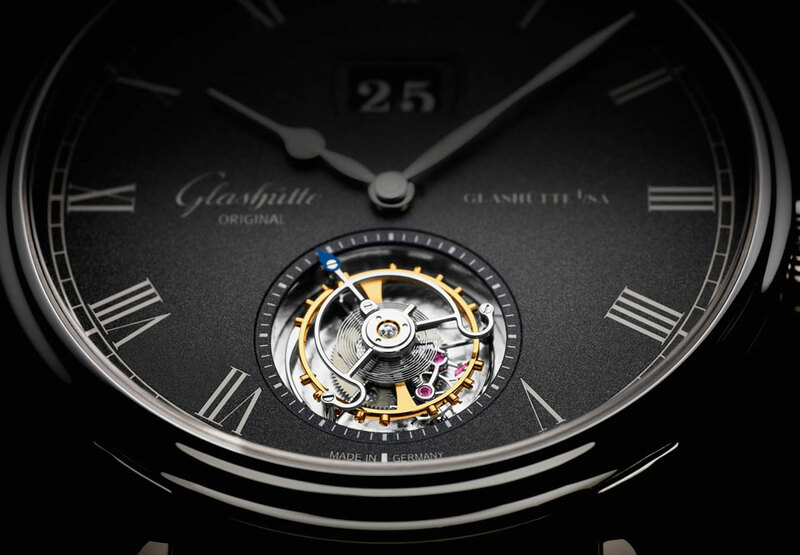 As a matter of fact, the movement is placed into the case without a rim, held in place only by suspension springs that act as shock absorbers. 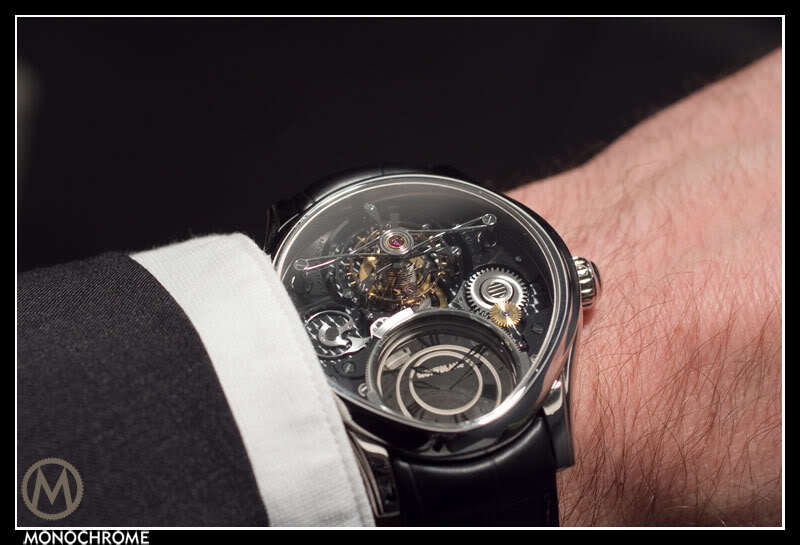 Equipped with these elastic suspensions, the hand-wound Calibre 440 appears to be flying inside its case and can absorb shocks of up to 5,000 G.
The most spectacular development incorporated in the Spirograph Tourbillon Sport is, without a doubt, its regulator, another example of Karsten Frässdorf’s constant quest for chronometry. It is hard to admire it in details when the watch is running. By pulling out the crown, the stop seconds mechanism freezes the oscillator. 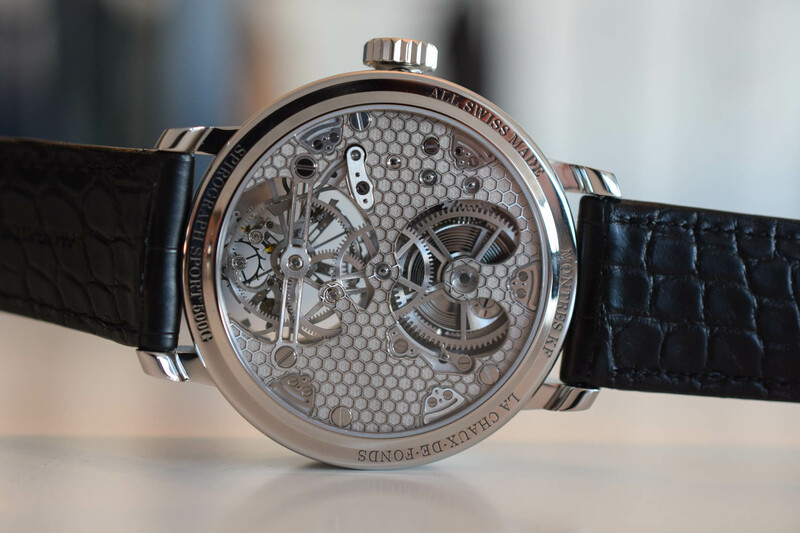 The oversized balance wheel features a technical, never-seen-before architecture – it features inertia of 85 mg/cm2 with auxiliary thermo-compensation (a major challenge in watchmaking – more details below). 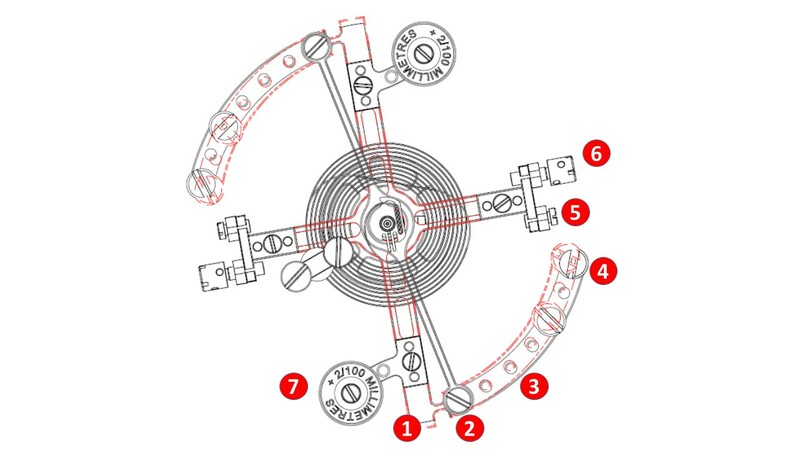 This unusual high-inertia required the development of a made-to-measure Swiss lever escapement. Just as with the previous versions of the Spirograph, the hairspring features a Grossmann inner curve and Phillips outer curve for optimal isochronism, hence optimal rate accuracy. It is fashioned out of Straumann alloy capable of withstanding magnetic fields up to 1,000 Gauss. The effect of temperature change is a major source of inaccuracy for mechanical watches. A rise in temperature increases the dimension of the balance wheel and this would cause it to swing more slowly. The need for precise timekeeping drove several advances in technology in relation to the design of the balance wheel and the materials used. 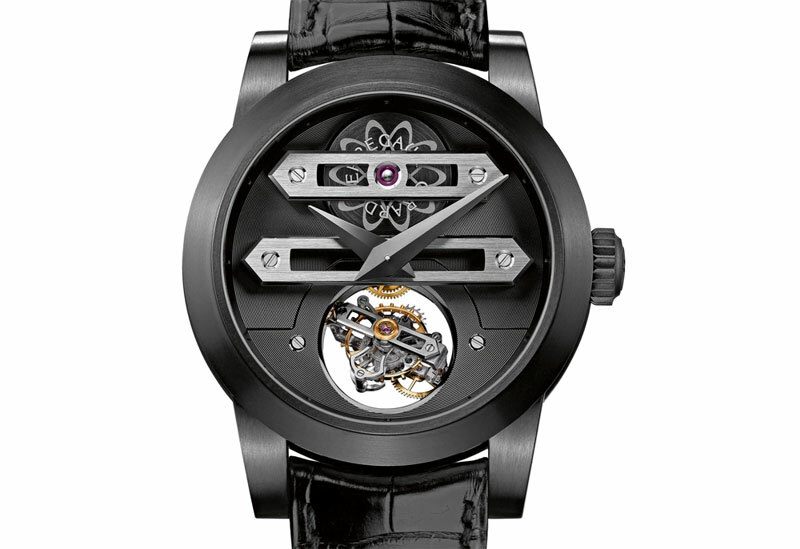 Among these, watchmakers developed bi-metallic balance wheels (above is a Girard-Perregaux tourbillon with a bimetallic balance). The rim of the balance is made of two different metals – steel inside, brass outside. The rim is cut at two points. Because of the different thermal expansion of the two metals, the bimetallic rim of the balance bends towards the centre of the oscillator as temperature increases shifting the mass inward. The bi-metallic balance wheel significantly reduced errors due to temperature. It was eventually made obsolete by the progress of metallurgy, the invention by Nobel prize Charles Edouard Guillaume of Invar (a nickel steel alloy with low thermal expansion) and Elinvar (an alloy with a very low thermo-elastic coefficient). 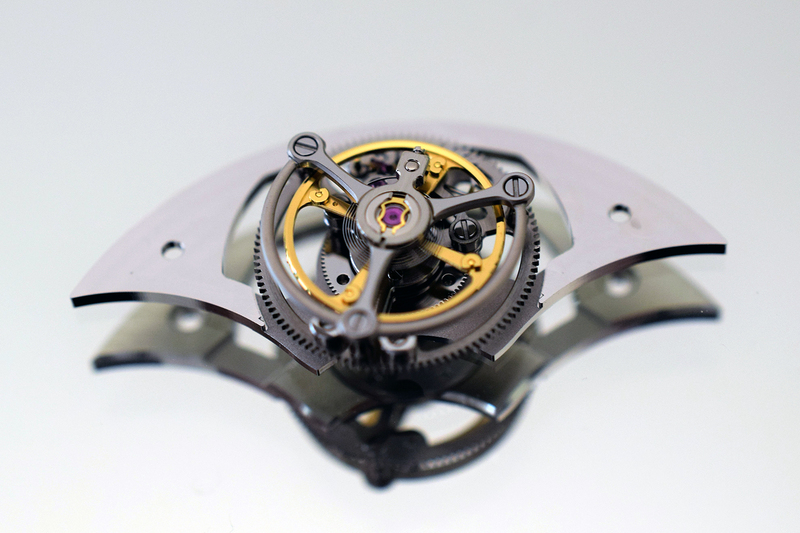 Subsequently, watchmakers have used self-compensating balances for decades. The impact of the expansion of the balance wheel with temperature is compensated by the changes in the balance spring properties that generate a time gain. The balance of the Spirograph Tourbillon Sport is crafted from anti-magnetic hardened steel to avoid deformation in the event of a shock. It is fitted with gold screws for inertia. It features two fixed arms for thermo-compensation, going a bit further than the traditional self-compensating balance. In practice, it features two axes/shafts crossing through the centre of the balance wheel: one extends with temperature, the other is invariable. When the temperature rises, the balance (1) extends. Doing so, the fixed arm (3) pivots around the screw (2) moving to the centre of the balance and shifting its mass inward. Watchmakers can regulate the impact of the system by changing the screws (4), with the weight of the material or its diameter or by displacing these on the arm. Finally, a third axis/shaft, perpendicular to the first, is fitted on either end with two screws, enabling fine adjustments (5) on the one hand (one turn equals 4 seconds per day), as well as classification of the balance-wheel (6) at 18,000 vibrations per hour. Weights (7) can be changed if more inertia is needed to keep the balance at the right frequency. 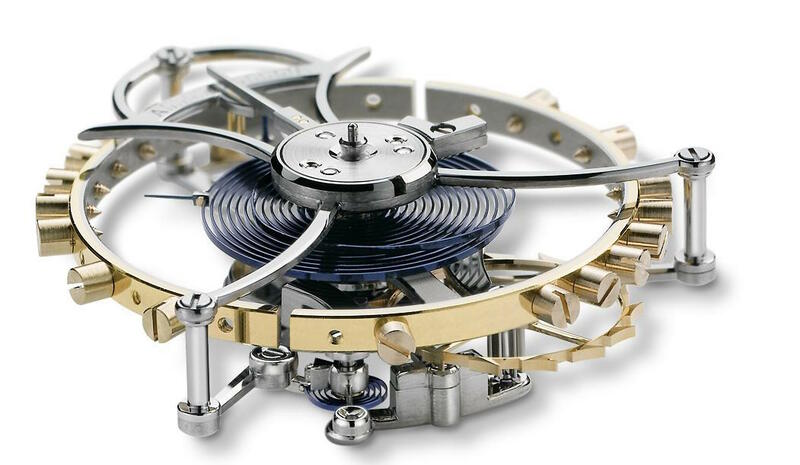 All in all, this sophisticated balance allows the watchmaker to perform fine and sophisticated adjustment of the regulating organ, and to have an influence on the temperature coefficient which is usually fixed once the hairspring is assembled with the balance wheel. 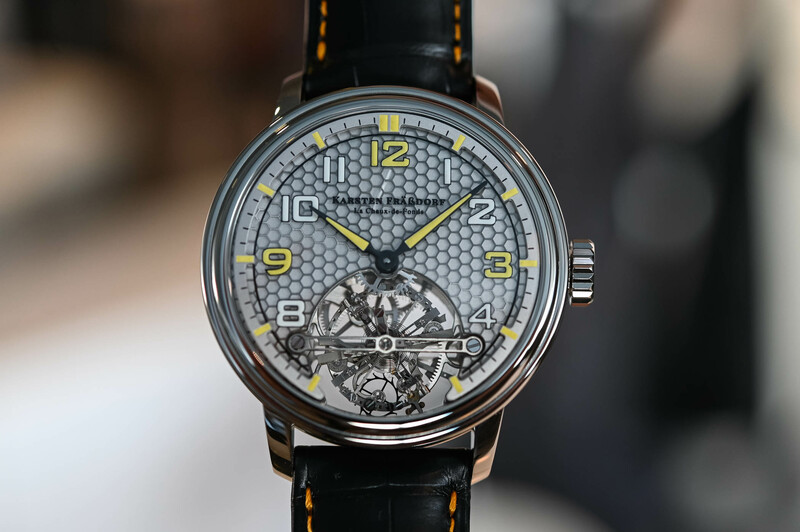 The Spirograph Tourbillon Sport is a limited edition of 10 pieces only, with numerous customization options. It is worn on an alligator leather strap with pin buckle. Price is set at CHF 90,000. 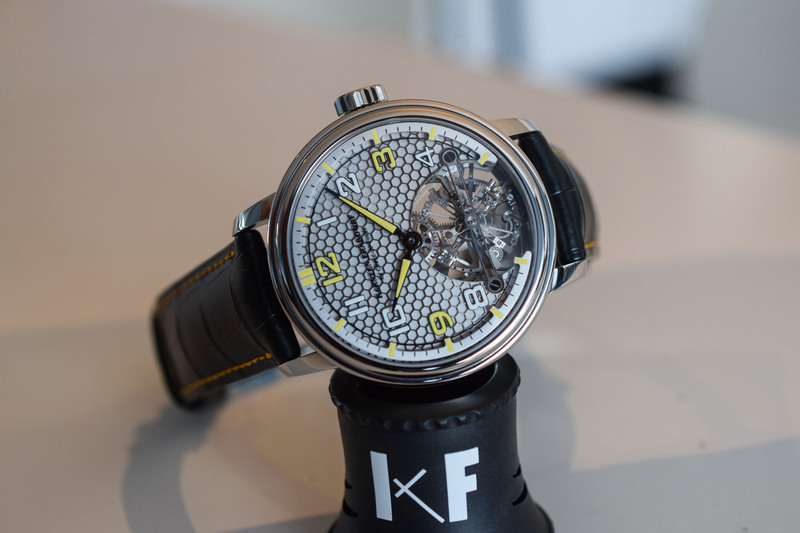 For more information, please visit www.montres-kf.com.